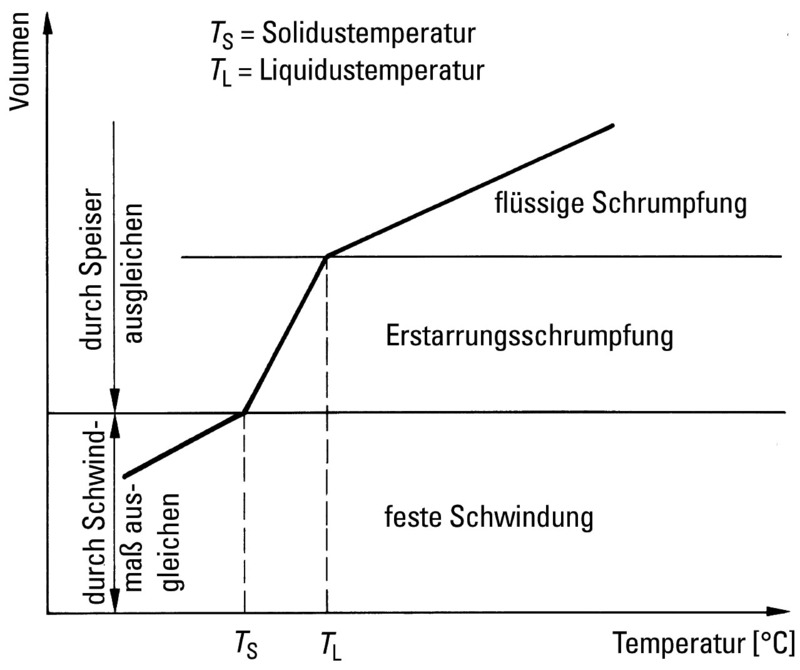 Open or closed space in the casting mold whose task it is to accumulate enough liquid material so that it is possible to appropriately compensate for the volume change taking place during solidification (Figure 1) and thus to prevent formation of cavities. For riser engineering it is only solidification shrinkage that matters, since it is the risers (s. Riser type) that help compensate for this change in volume. Consequently, the risers must always be installed at a higher leveln than the area to be filled and they must be connected to those areas of the casting with the predominant cavity risk (s. Cavities). Moreover, it must be dimensioned so that it solifies last or at least later than the area(s) at risk. This is ensured when the solidificationmodulus of the riser (Eq. 1, i.e. volume-surface ratio of the riser) is around 20 % higher than that of the casting section to be densly fed (casting modulus) i.e. Today, the “liquid metal reservoir” of the riser is defined by means of suitable calculation algorithms and/or with the help of Solidification simulation programs, so that its design complies with both the modulus and the shrinkage requirements (Figure 2 -Foseco Foundry Division Vesuvius GmbH, Borken, Germany).